You know what they say about buses? Well I’ve had a similar experience with panettone recently. 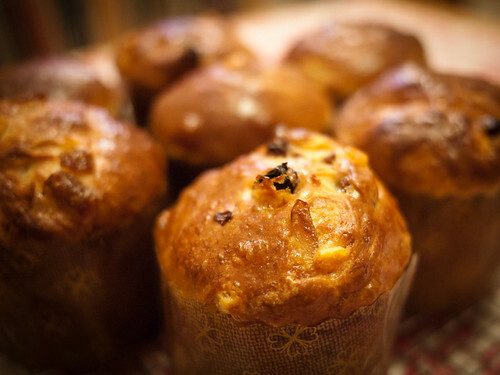 Having previously only occasionally eaten those mini ones at a well-known coffee shop chain, suddenly my life seemed to be filled with panettone. As well as taking part in a bake off, I had the fortune to be invited to a masterclass held by a top Italian pastry chef. So in keeping with those proverbial buses, here’s my three wise panettone. What kicked off all this sweet fruit bread shenanigans was a Young & Foodish CoffeeSaturday bake off. What with the festive season around the corner and the venue being Melograno Alimentari, the fantastic Italian delicatessen in Holland Park the theme was naturally the famous Christmas bread. 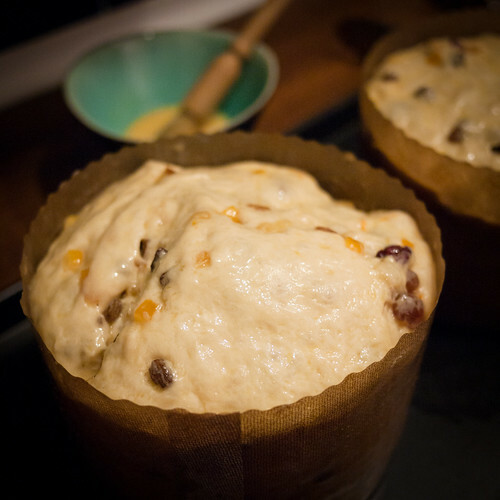 Despite Panettone’s reputation for requiring hours of kneading and long proving periods – I discovered this fantastic recipe on the web, that requires no kneading and only a day of proving in the refrigerator. I’ll be honest, I was skeptical, I’m no expert on the science of baking, but surely this was too good to be true; however, the results defied logic and tradition. I intended to try a more labour intensive method to compare, but the day job got the better of me, which is how I ended up chancing my arm for the bake off with this no-knead recipe. I won’t lie I felt like a bit of a charlatan, I was sure that my fellow competitors would be pounding dough in earnest and my secret cheat’s panettone would be found wanting. So you can imagine my surprise when my entry carried the day. It’s only fair that all the credit goes to Jeff Hertzberg and Zoe Francios of Artisan Bread in Five Minutes, their recipe truly is a failsafe method that means anyone can bake a tasty panettone for Christmas. I should add that I couldn’t attend most of the CoffeeSaturday because it clashed with Masterclass so I am indebted to the Missus for her sterling work representing me at another of Daniel’s fabulous coffee gatherings. 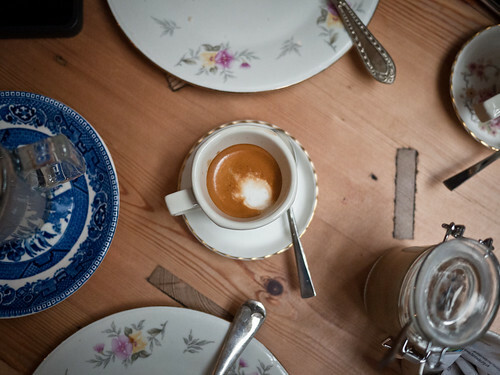 Join the Young & Foodish mailing list or follow @CoffeeSaturday on Twitter for future events. So quite by coincidence in the week leading up to the bake off, I was invited to a panettone Masterclass. The class was being held by top pasticcere Luca Balboni, former head pastry chef at the award-winning Osteria Francescana and a former assistant pasticcere at El Bulli; this was simply too good an opportunity to pass up. The masterclass took place at the rather lovely La Galatiera a wonderful gelato shop and cafe in Covent Garden. Although quite tiny, it’s fabulous what they’ve done with the space. Lots of reclaimed timber has been used, while natural hues evoke the care and natural nature of the shop’s produce. I particularly like the brightly painted wooden crates used as shelves and the window in the floor so you can see the magic being worked in the basement bakery is a fantastic touch. We descended into said basement for the Masterclass, for a fun, informative and very hands-on morning. 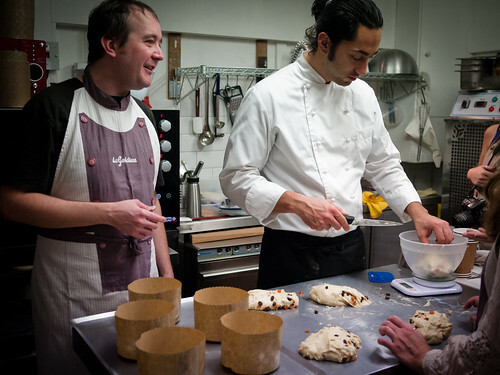 Luca took us through three different panettone methods. 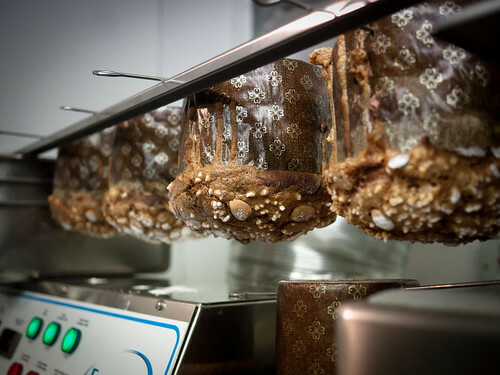 A very traditional version that uses a mother yeast, a more attainable version that uses packet fresh yeast, that can be made in a morning, and finally his signature dish the ‘espresso panettone’. Dispensed from a siphon into a paper cup and ‘zapped’ for forty seconds in an the microwave, Luca created this wonderfully light sponge using techniques he learnt during his time at El Bulli. Sadly Luca was quite tight lipped about how this one was made, but it was a delightful creation, served chilled with a dusting of icing sugar and chopped nuts. So, with the Masterclass done, we retired upstairs to the cafe to enjoy another excellent coffee and to eat our freshly baked panettone. 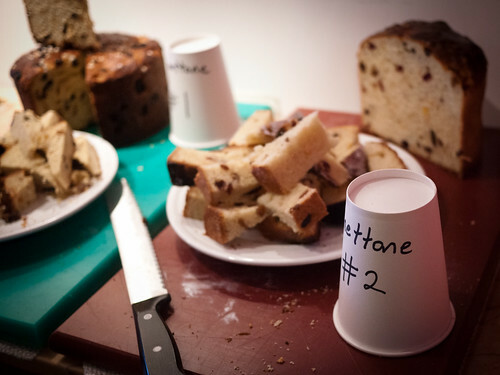 Now I’ll be honest, the accessible easy to do panettone is delicious – but it isn’t a patch on the traditional mother yeast one that Luca served before the masterclass. I certainly wouldn’t deter people from making the easier version, but for me there’s no competition. But as both realistically require a proper stand mixer to make I won’t be making either any time soon. 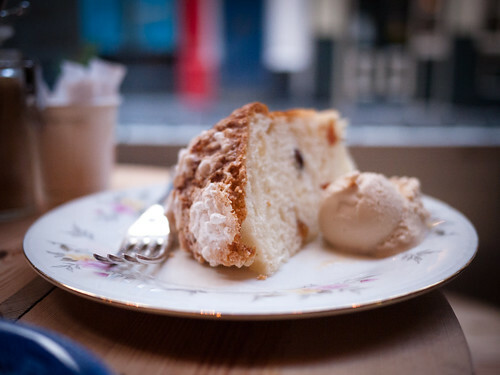 So this leaves the third option – the Chef’s Panettone. 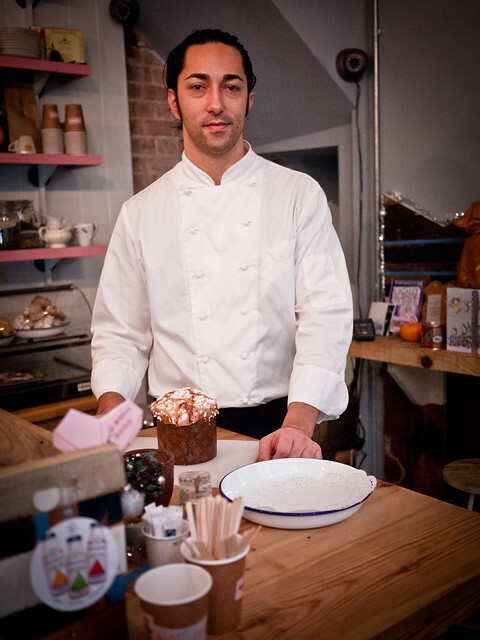 Luca’s Balboni’s panettone are available to buy from La Gelatiera throughout the Christmas period. So if you’re a bit busy to break out the baking pans my advice is to sneak away from the festive madness and pop into La Gelatiera and try one for yourself with a little of Antonio’s superb gelato and an espresso of course. Wonderful post! Thanks for sharing this experience and photos with us! 🙂 Sooner or later I hope to attend one of La Gelatiera masterclasses! Get Your Mo On Bro! Pie For Brains · All food is pie!